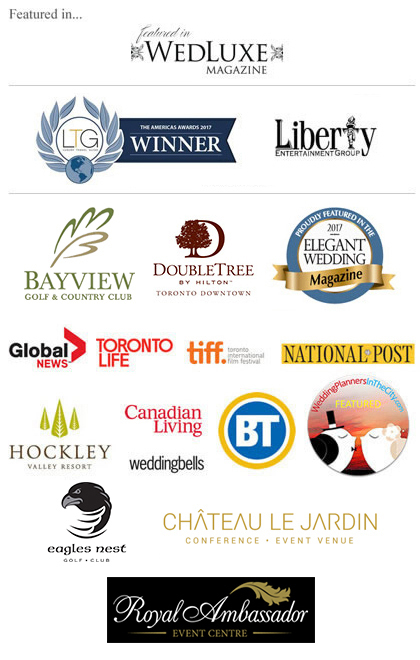 Highly esteemed with a strong, 18 year footprint in our industry, Let’s Party Consultants Inc. has been honoured with prestigious recognition from varying media sources. Voted among the top 10 planners in Toronto by Toronto Life Magazine. Featured in numerous segments on Global TV, including the Morning Show. Highlighted in various segments on Breakfast Television. Proudly featured in numerous media forums over our 18 year career! The Liberty Grand & the Liberty Entertainment Group, including Casa Loma. Pegasus Group, including The Grand Luxe & Palais Royale. ..…… and numerous venues with the GTA.